The Access Settings feature must be activated for your institution by Interfolio. If you would like this feature activated, please submit a support ticket. A proxy user does not have access to the Admin section tab or administrator functions, even if the faculty member for the account they are assigned to has this access. A proxy user does not have access to the evaluations functionality and cannot access dashboard entries related to evaluations. On the Navigation menu, click Access Settings. The Access Settings screen displays. Users Granted Access to My Account: Displays faculty members who are currently a proxy user on your faculty account. In the Users Granted Access to My Account section, click Add. The Add Access dialog box opens. 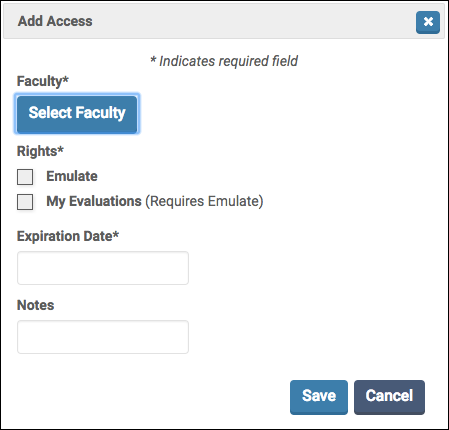 Select the faculty member(s) to whom you wish to assign proxy access. All active faculty accounts are available. Click Save. If necessary, click the Edit icon to make changes to a user's proxy access. Click the Delete icon to remove a user's proxy access.